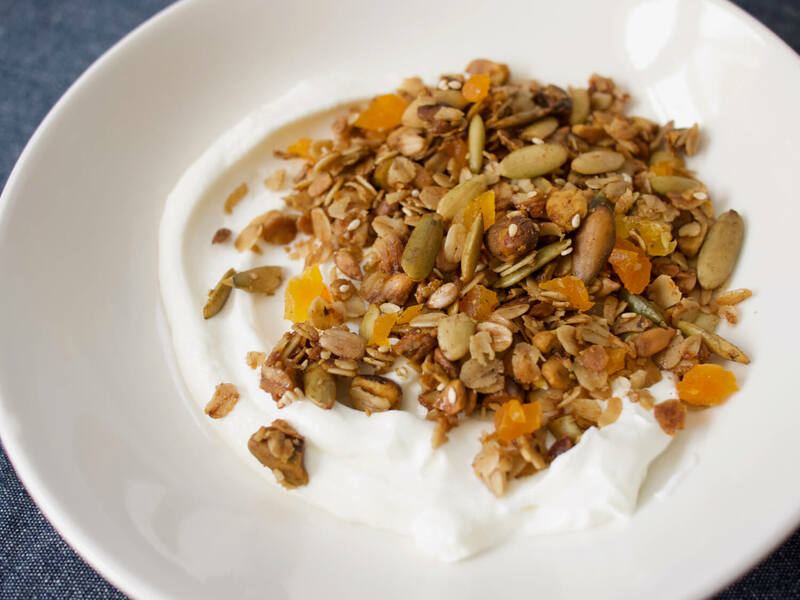 Cardamom and apricot make a sweetly spiced pairing in this easy granola packed with flavor. Granola is one of those things that's almost always better to make yourself than to buy. It never involves much more than stirring some ingredients together, popping them into the oven, and stirring occasionally to keep everything browning evenly. Once you have that technique down, you can adjust the ingredients and flavors to your heart's desire, substituting pretty much any nut, seed, or seasoning to suit your cravings. This recipe combines a variety of tasty nuts and seeds with Vanns Cardamom, Cinnamon, Ginger, and Vanilla to make a subtly spiced base for the addition of chopped apricots at the end, adding pops of sweetness to the toasty granola. Heat oven to 325°F. Line a rimmed baking sheet with parchment paper or a silicon baking mat. In a small saucepan over medium heat, stir together maple syrup, honey, and vegetable oil and heat until evenly combined. Stir in vanilla and remove from heat. Stir together oats, pistachios, pepitas, sunflower seeds, sesame seeds, salt, cinnamon, cardamom, and ginger together in a large bowl. Add the liquid mixture and stir with a silicone spatula until evenly combined. Spread the mixture out into an even layer on the prepared baking sheet. Bake until fragrant and golden brown, 30-45 minutes, stirring every 15 minutes to ensure even cooking, making sure to get into the corners of the pan as those are more likely to singe. When browned to your liking, remove pan from the oven and allow to cool completely on a baking rack -- granola will crisp and firm up even more as it cools. Stir in the chopped apricots and store in an airtight container for 3-4 weeks. Father's Day is coming up this weekend, and you know what that means -- big, tasty breakfast time! If you're going for a savory situation, with bacon, eggs, toast, and whatever else Dad loves, this is a great recipe to add a touch of sweetness to the end. The simple addition of Vanns Cardamom can make your daily coffee habit feel like a special occasion.